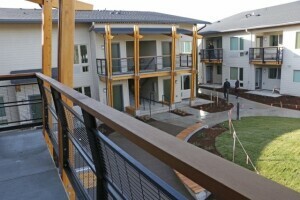 The 40-unit NAYA Generations has opened in Portland’s Lents neighborhood. 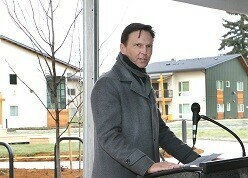 A new affordable housing community aims to bring together seniors and families with foster children in Portland, Ore. The new 40-unit NAYA Generations development provides foster families and seniors with affordable housing in Portland, Ore. Replacing an unused school building, the 40-unit NAYA Generations seeks to address the overrepresentation of Native American youth in the foster-care system. The affordable housing development also serves as home to community elders. The intergenerational community is a partnership between Guardian Real Estate Services, an experienced affordable housing developer, and the Native American Youth and Family Center (NAYA). Residents can contribute to the community in a variety of ways, including teaching cultural values and history, indigenous storytelling, supporting community ceremonies, and mentoring, according to project sponsors. NAYA Generations is more than housing, says Tom Brenneke, president of Guardian Real Estate Services, calling it a community that promotes stability. The new development has apartments ranging from one to four bedrooms to serve households earning no more than 60% of the area median income. NAYA Generations is unique because it has a preference to serve foster families, particularly those with Native American children. A study found that one in five Native American children in Multnomah County is placed in foster care. That’s a rate more than 24 times worse than it is for white children, according to The Native American Community in Multnomah County: An Unsettling Profile, a 2011 report by Coalition of Communities of Color and Portland State University. In the early stages of the project, Gov. John Kitzhaber designated the development as an Oregon Solutions project, an effort that brings together different stakeholders to create sustainable community projects. Future additions to the project may include a Head Start facility. The approximately $12 million development is financed largely with 9% low-income housing tax credit from Enterprise Community Investment. JPMorgan Chase is the permanent and construction lender. Other partners in the funding and development of this project include Meyer Memorial Trust, Network for Oregon Affordable Housing, Oregon Housing and Community Services, Portland Housing Bureau, and Portland Public Schools. Carleton Hart Architecture designed the community. Other partners in the development include LMC Construction and BC Group.